Our research is aimed at understanding the molecular origins of neurodegenerative disorders, including Alzheimer's and Parkinson's diseases, and at opening in this way novel opportunities for drug discovery to prevent, delay or treat these conditions. We have set up an interdisciplinary approach that brings together concepts and methods from chemistry, physics, engineering, genetics and medicine, using a combination of in silico, in vitro and in vivo approaches. This programme is based on the premise that physical and chemical sciences can provide relevant contributions to address biological questions to understand the normal and aberrant behaviours of proteins and their links with human disease. We are thus investigating the nature and consequences of the failure to maintain protein homeostasis, and its association with ageing and neurodegenerative disorders. We carry out this programme in the recently established Centre for Misfolding Diseases, which is hosted in the new Chemistry of Health building. SAR by kinetics for drug discovery for protein misfolding diseases. Proc. Natl. Acad. Sci USA (2018). Protein oligomers are increasingly recognized as the most cytotoxic forms of protein aggregates. It has been very challenging, however, to target these oligomers with therapeutic compounds, because of their dynamic and transient nature. To overcome this problem, we present here a 'structure kinetic-activity relationship' (SKAR) approach, which enables the discovery and systematic optimization of compounds that reduce the number of oligomers produced during an aggregation reaction. 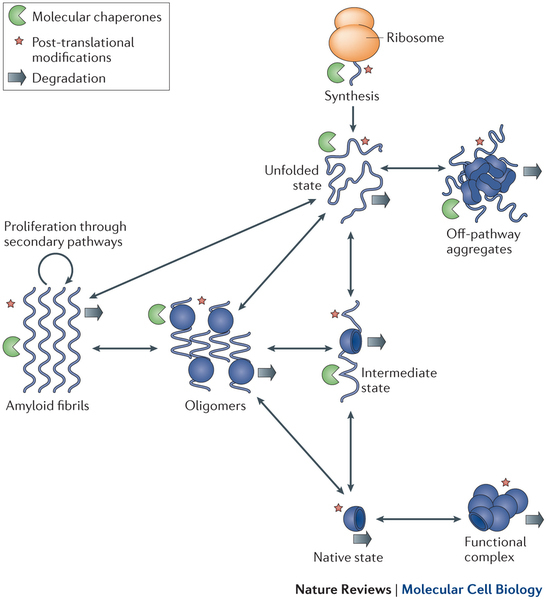 We illustrate this strategy for the amyloid beta peptide (Abeta), which is closely associated with Alzheimer's disease, by developing a rhodanine compound capable of dramatically reducing the production of Abeta oligomers. As this strategy is general, it can be applied to oligomers of any protein. Cholesterol catalyses Abeta42 aggregation through a heterogeneous nucleation pathway in the presence of lipid membranes. Alzheimer's disease is a neurodegenerative disorder associated with the aberrant aggregation of the amyloid beta peptide. Although increasing evidence implicates cholesterol in the pathogenesis of Alzheimer's disease, the detailed mechanistic link between this lipid molecule and the disease process remains to be fully established. To address this problem, we adopt a kinetics-based strategy that reveals a specific catalytic role of cholesterol in the aggregation of Abeta42 (the 42-residue form of the amyloid beta peptide). More specifically, we demonstrate that lipid membranes containing cholesterol promote Abeta42 aggregation by enhancing its primary nucleation rate by up to 20-fold through a heterogeneous nucleation pathway. We further show that this process occurs as a result of cooperativity in the interaction of multiple cholesterol molecules with Abeta42. These results identify a specific microscopic pathway by which cholesterol dramatically enhances the onset of Abeta42 aggregation, thereby helping rationalize the link between Alzheimer's disease and the impairment of cholesterol homeostasis. Simultaneous determination of protein structure and dynamics using cryo-electron microscopy. Biophysical Journal (2018). 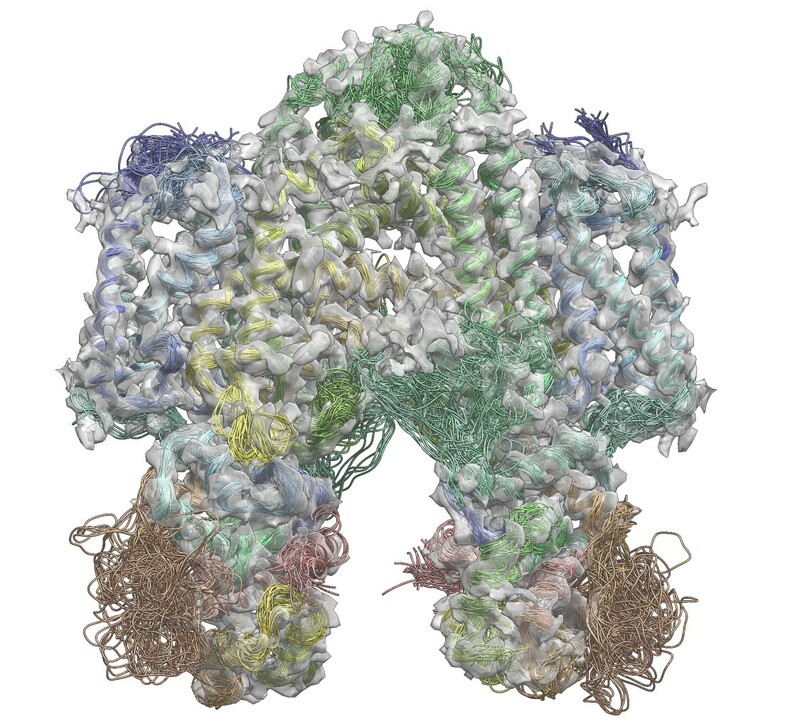 Cryo-electron microscopy is rapidly emerging as a powerful technique to determine the structures of complex macromolecular systems elusive to other techniques. Since many of these systems are highly dynamical, characterising also their movements is a crucial step to unravel their biological functions. To achieve this goal, we report an integrative modelling approach to simultaneously determine structure and dynamics from cryo-electron microscopy density maps. By quantifying the level of noise in the data and dealing with their ensemble-averaged nature, this approach enables the integration of multiple sources of information to model ensembles of structures and infer their populations. 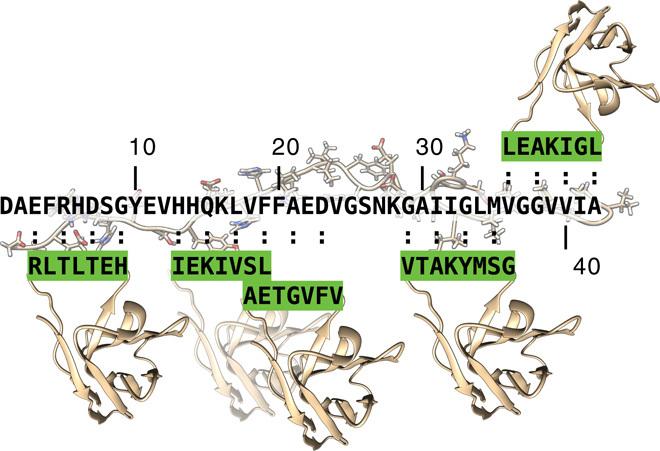 We illustrate the method by characterising structure and dynamics of the integral membrane receptor STRA6, thus providing insights into the mechanisms by which it interacts with retinol binding protein and translocates retinol across the membrane. Selective targeting of primary and secondary nucleation pathways in Abeta42 aggregation using a rational antibody scanning method. Antibodies targeting Abeta42 are under intense scrutiny because of their therapeutic potential for Alzheimer's disease. To enable systematic searches, we present an â€œantibody scanningâ€� strategy for the generation of a panel of antibodies against Abeta42. Each antibody in the panel is rationally designed to target a specific linear epitope, with the selected epitopes scanning the Abeta42 sequence. 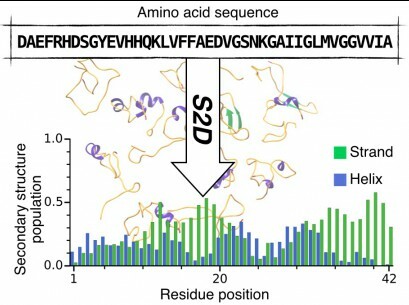 By screening in vitro the panel to identify the specific microscopic steps in the Abeta42 aggregation process influenced by each antibody, we identify two antibodies that target specifically the primary and the secondary nucleation steps, which are key for the production of Abeta42 oligomers. These two antibodies act, respectively, to delay the onset of aggregation and to block the proliferation of aggregates, and correspondingly reduce the toxicity in a Caenorhabditis elegans model overexpressing Abeta42. These results illustrate how the antibody scanning method described here can be used to readily obtain very small antibody libraries with extensive coverage of the sequences of target proteins. Proc. Natl. Acad. Sci. USA (2017). The aggregation of the 42-residue form of the amyloid-beta peptide (Abeta42) is a pivotal event in Alzheimer's disease (AD). The use of chemical kinetics has recently enabled highly accurate quantifications of the effects of small molecules on specific microscopic steps in Abeta42 aggregation. 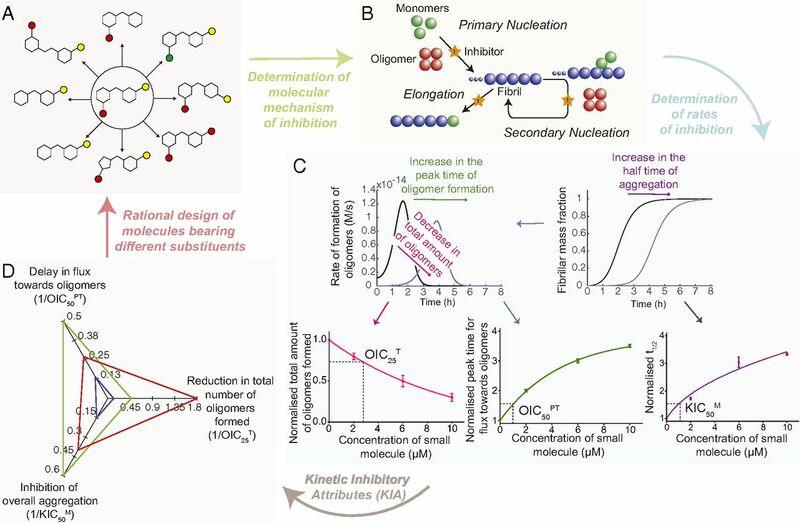 Here, we exploit this approach to develop a rational drug discovery strategy against Abeta42 aggregation that uses as a read-out the changes in the nucleation and elongation rate constants caused by candidate small molecules. 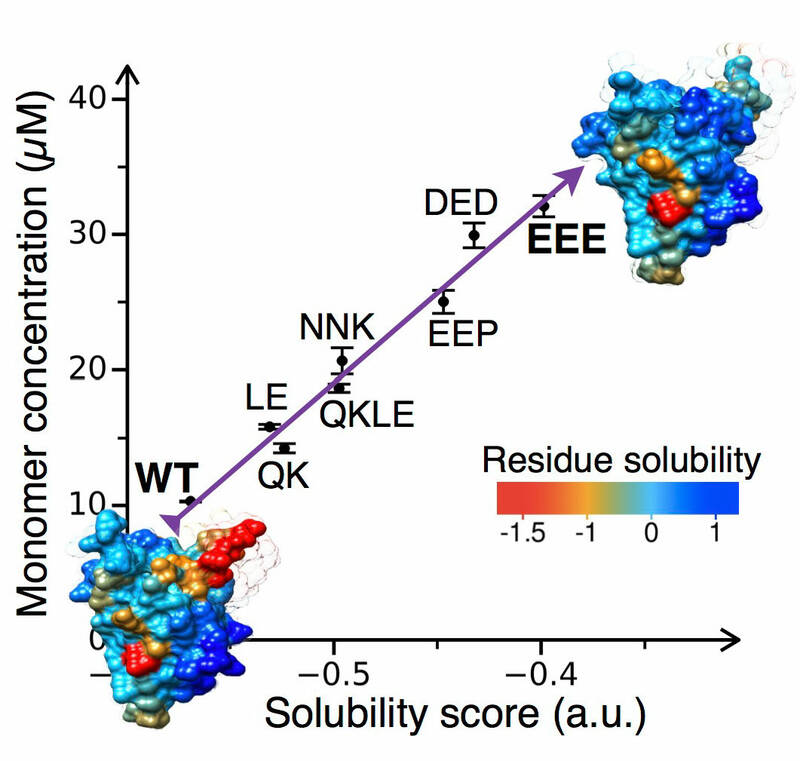 We thus identify a pool of compounds that target specific microscopic steps in Abeta42 aggregation. We then test further these small molecules in human cerebrospinal fluid and in a Caenorhabditis elegans model of AD. Our results show that this strategy represents a powerful approach to identify systematically small molecule lead compounds, thus offering an appealing opportunity to reduce the attrition problem in drug discovery. A protein homeostasis signature in healthy brains recapitulates tissue vulnerability to Alzheimer's disease. Science Advances (2016). In Alzheimer's disease, aggregates of Abeta and tau in amyloid plaques and neurofibrillary tangles spread progressively across brain tissues following a characteristic pattern, implying a tissue-specific vulnerability to the disease. We report a transcriptional analysis of healthy brains and identify an expression signature that predicts - at ages well before the typical onset - the tissue-specific progression of the disease. We obtain this result by finding a quantitative correlation between the histopathological staging of the disease and the expression patterns of the proteins that coaggregate in amyloid plaques and neurofibrillary tangles, together with those of the protein homeostasis components that regulate Abeta and tau. 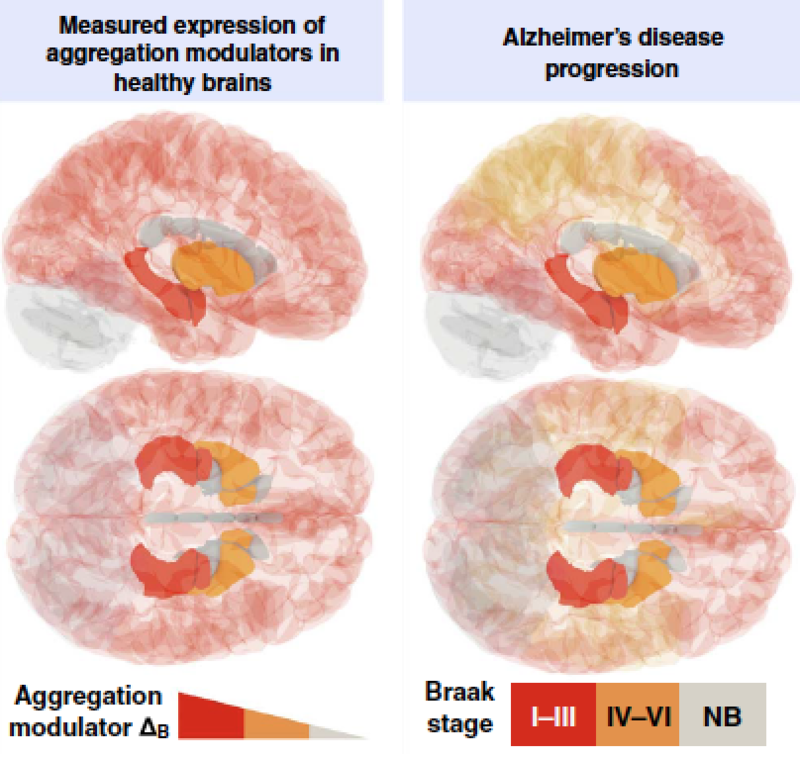 Because this expression signature is evident in healthy brains, our analysis provides an explanatory link between a tissue-specific environmental risk of protein aggregation and a corresponding vulnerability to Alzheimer's disease. An anti-cancer drug suppresses the primary nucleation reaction that initiates the formation of toxic Abeta aggregates linked with Alzheimer's disease. Science Advances (2016). The conversion of the Abeta peptide into pathogenic aggregates is linked to the onset and progression of Alzheimer's disease. Although this observation has prompted an extensive search for therapeutic agents to modulate the concentration of Abeta or inhibit its aggregation, all clinical trials with these objectives have so far failed, at least in part because of a lack of understanding of the molecular mechanisms underlying the process of aggregation and its inhibition. To address this problem we describe a chemical kinetics approach for rational drug discovery, in which the effects of small molecules on the rates of specific microscopic steps in Abeta aggregation are analysed quantitatively. By applying this approach we report that bexarotene, an FDA-approved anti-cancer drug, targets selectively the primary nucleation step in Abeta aggregation, delays the formation of toxic species in neuroblastoma cells and completely suppresses Abeta deposition and its consequences in a C. elegans model of Abeta-mediated toxicity. These results suggest that the prevention of the primary nucleation of Abeta by compounds such as bexarotene could potentially reduce the risk of onset of Alzheimer's disease, and more generally that our strategy provides a general framework for the rational identification of a range of candidate drugs directed against neurodegenerative disorders. 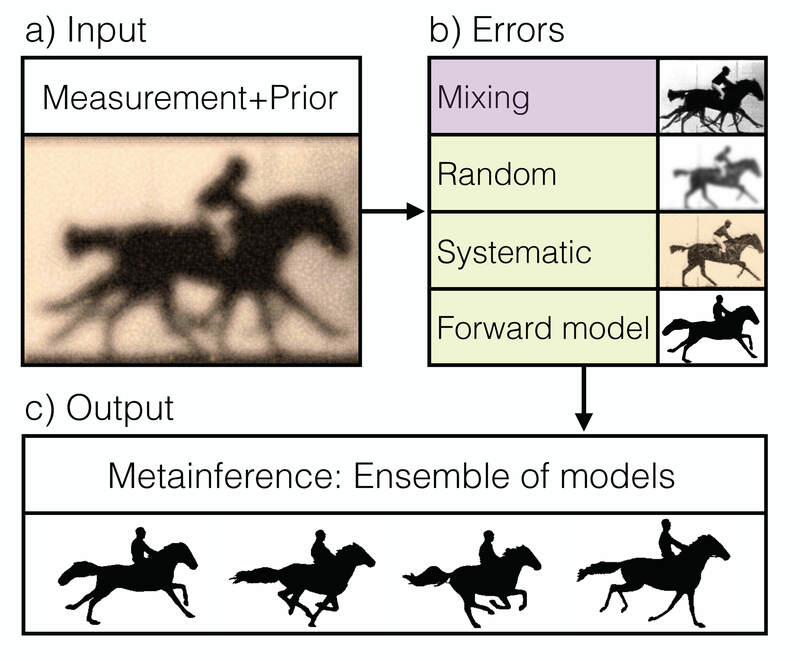 Metainference: A Bayesian inference method for heterogeneous systems. Science Advances (2016). Modelling a complex system is almost invariably a challenging task. The incorporation of experimental observations can be used to improve the quality of a model, and thus to obtain better predictions about the behavior of the corresponding system. This approach, however, is affected by a variety of different errors, especially when a system populates simultaneously an ensemble of different states and experimental data are measured as averages over such states. To address this problem we present a Bayesian inference method, called 'metainference', that is able to deal with errors in experimental measurements as well as with experimental measurements averaged over multiple states. To achieve this goal, metainference models a finite sample of the distribution of models using a replica approach, in the spirit of the replica-averaging modelling based on the maximum entropy principle. To illustrate the method we present its application to a heterogeneous model system and to the determination of an ensemble of structures corresponding to the thermal fluctuations of a protein molecule. Metainference thus provides an approach to model complex systems with heterogeneous components and interconverting between different states by taking into account all possible sources of errors. CamSol: A method of rational design of protein variants with enhanced solubility. P. Sormanni, F. A. Aprile and M. Vendruscolo. J. Mol. Biol. 427, 478-490 (2015). P. Sormanni, C. Camilloni, P. Fariselli and M. Vendruscolo. J. Mol. Biol. 427, 982-996 (2015). 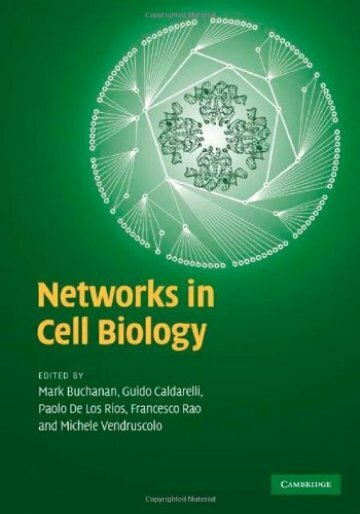 M. Buchanan, G. Caldarelli, P. De Los Rios, F. Rao and M. Vendruscolo (Eds). Cambridge University Press, Cambridge (2010).